"We want to get our customers to the show they want to watch quickly"
LONDON--(BUSINESS WIRE)--Roku, Inc. (NASDAQ: ROKU) today announced that it will soon make its Enhanced Voice Search feature available to Roku users in the UK. Enhanced Voice Search enables users to use their voice to find entertainment to watch. The new feature will be available for Roku® players through the Roku mobile app, and for the Roku Streaming Stick+ through the remote control. Roku OS 8.1 will begin to roll out through a software update beginning on May 1. Enhanced Voice Search allows for more natural language understanding and can search for movies, shows, actors and directors, or even launch streaming channels, in a more conversational tone. For example, a user can say things like, “show me comedies”, “find The Grand Tour” or “launch hayu”. The Roku mobile app, available for iOS® and Android™, acts as a remote, streams media from a mobile device to the TV, includes a keyboard and offers features like voice search and private listening. In addition, Roku OS 8.1 will enable private listening for up to four devices concurrently for all Roku players. Roku OS 8.1 will begin to roll out on May 1. 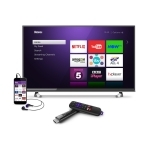 The Roku Streaming Stick+ is available from all major retailers for a suggested retail price of £79,99. Roku pioneered streaming to the TV. We connect users to the streaming content they love, enable content publishers to build and monetize large audiences, and provide advertisers with unique capabilities to engage consumers. Roku streaming players and Roku TV™ models are available around the world through direct retail sales and licensing arrangements with TV OEMs and service operators. Roku was founded by Anthony Wood and is headquartered in Los Gatos, Calif. U.S.A. This press release contains “forward-looking” statements that are based on our beliefs and assumptions and on information currently available to us on the date of this press release. Forward-looking statements may involve known and unknown risks, uncertainties and other factors that may cause our actual results, performance or achievements to be materially different from those expressed or implied by the forward-looking statements. These statements include, but are not limited to the timing and availability of future software releases and the functionality enabled in such releases. Except as required by law, we assume no obligation to update these forward-looking statements publicly, or to update the reasons actual results could differ materially from those anticipated in the forward-looking statements, even if new information becomes available in the future. Important factors that could cause our actual results to differ materially are detailed from time to time in the reports Roku, Inc. files with the Securities and Exchange Commission, including our Form 10-K for the quarter and year ended December 31, 2017. Copies of reports filed with the SEC are posted on Roku’s website and are available from Roku without charge. Roku, Roku TV and Streaming Stick are registered trademarks of Roku, Inc. in the U.S. and in other countries.